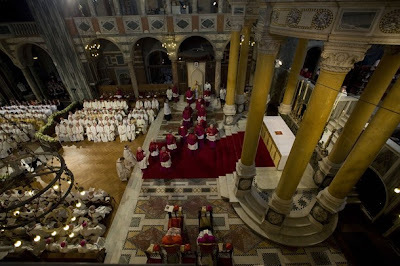 Whispers in the Loggia: "The Lord Vincent"
Using the ancient rite that's long installed the archbishops of Canterbury, Vincent Gerard Nichols was enthroned this morning at Westminster Cathedral as the eleventh primate of England and Wales since the Reformation. 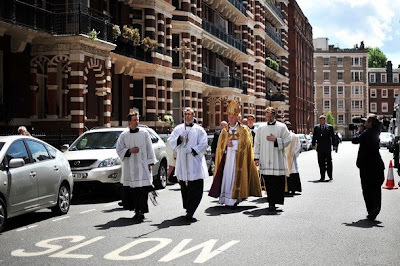 With the 63 year-old formally at the reins, Pope Benedict's appointees now sit in four of the English-speaking world's top six ecclesial posts. Britain's Catholic Herald has full coverage in real time, including the text of Nichols' homily, given below. My brothers and sisters, I welcome you and I thank you all for coming to Westminster Cathedral today. I appreciate the presence and the prayers of each of you. I greet and thank the Apostolic Nuncio, here representing the Holy Father. Through him, I thank Pope Benedict for the confidence that he has placed in me in making this appointment and for his blessing as I take it up. I thank the Duke of Norfolk, the Earl Marshal, for his presence and Lord Guthrie for representing the Prince of Wales. We are honoured that you are here. I am grateful also to Mr Paul Murphy, here representing the Prime Minister. I appreciate too the presence of politicians and civic leaders. I salute all the bishops, priests and deacons who are here, especially Their Eminences Cardinal Mahony from Los Angeles, Cardinal O'Brien of St Andrews and Edinburgh and Cardinal Seán Brady from Armagh. I am so glad to see so many fellow church leaders and leaders of other Faiths, from the West Midlands and, of course, from London. I thank Archbishop Rowan for his gracious words of welcome, too. I thank the BBC for broadcasting this ceremony live on television and I greet all those joining us at home. May I also express my deep appreciation to Cardinal Cormac Murphy-O'Connor for the very warm welcome that he has given to me and for his unfailing encouragement and support. 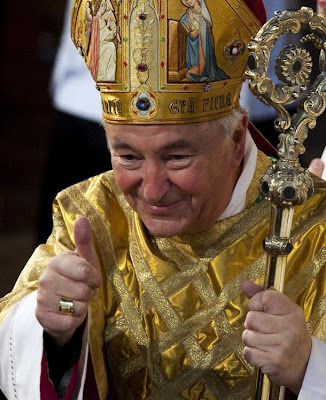 Much more importantly, on behalf of so many, I want to salute the tremendous contribution he has made both to the Diocese of Westminster and to the Catholic Church nationally and internationally in his years as Archbishop of Westminster. His leadership has been unflinching and often very courageous, and I know that he will always have a special place in our affections and prayers. The readings of the Scriptures that we have heard today centre on the figure of St Paul and we have heard Paul's own account of his dramatic conversion to Christ on the road to Damascus. It is a story of great power and one from which we can draw much encouragement. In the first place, we learn that Paul was, "a zealous believer in God". His conversion then was not to belief in God but to belief in God's full presence in Jesus Christ. This fact is important to us all. Through life-long belief, Paul was already open to the things of God, ready to recognise the touch of the Divine in the unexpected. This is the true nature of the belief in God: it opens us to all that lies beyond. It's a constant invitation to go beyond our immediate knowledge and awareness, and even our current commitments. Faith in God is not, as some would portray it today, a narrowing of the human mind or spirit. It is precisely the opposite. Faith in God is the gift that takes us beyond our limited self, with all its incessant demands. It opens us to a life that stretches us, enlightens us, and often springs surprises upon us. Such faith, like love, sees that which is invisible and lives by it. From Paul, then, we learn that the inner life of each one of us is crucial for our wellbeing. In our hearts we need the same openness to God as he had. This is expressed in daily moments of tranquillity and prayer when we regain a true sense of proportion, recognising afresh that God alone fulfils our deepest yearnings. Without such moments we quickly lose a sense of who we truly are. It is before God that we gather here today, that he may touch and heal us. But let us return to the Damascus road. Paul hears remarkable words: 'Saul, Saul, why are you persecuting me?' He recognises the voice of the Lord. Now he has to embrace the real identification between the risen Christ and the community of Christians he is persecuting. This is a troubling identification and it remains so today. Those who embrace belief in Christ Jesus are bound together in Him, in a real yet incomplete way, in his Body, the Church. Faith is never a solitary activity nor can it be simply private. Faith in Christ always draws us into a community and has a public dimension. This community of faith reaches beyond ethnicity, cultural difference and social division, opening for us a vision of ourselves, and of our society, as having a single source and a single fulfilment. Indeed this vision of faith is expressed powerfully by St Paul when, in his letter to the Galatians, he says that in Christ, "There is no longer Jew or Greek, there is no longer slave or free, there is no longer male and female, for all of you are one in Christ Jesus". This is a vision of true social cohesion, a promise which lies ahead and a signpost of which churches construct, Sunday by Sunday, with their communities of unity in diversity. Faith builds community and it expresses itself in action. As a society, if we are to build on this gift of faith, we must respect its outward expression not only in honouring individual conscience but also in respecting the institutional integrity of the communities of faith in what they bring to public service and to the common good. Only in this way will individuals, families and faith communities become whole-hearted contributors to building the society we rightly seek. Paul's conversion on the Damascus Road has a third aspect to it. His life is now centred on Christ and the Church. But he also grasps a truth about all creation. And he wants to share it. In Christ his mind is now open, even to pagan philosophy. He now has the courage and the determination to go, for example, to the Areopagus in Athens and engage with the Greek philosophers. He struggles to find the language in which the insights and light of Christian faith can be brought into dialogue with the finest minds of his age. As we know, his attempts at the Areopagus were not very successful. Yet this is a reminder of the task facing us all: that of the intense dialogue across faiths and our contemporary world. This dialogue needs to go beyond the superficial and the slogans. Respectful dialogue is crucial today and I salute all who seek to engage in it. In this the media have such an important part to play, not by accentuating difference and conflict, but by enhancing creative conversation. Let us be a society in which we genuinely listen to each other, in which sincere disagreement is not made out to be insult or harassment, in which reasoned principles are not construed as prejudice and in which we are prepared to attribute to each other the best and not the worst of motives. In these matters, we ourselves in the Churches have so much to learn and do. Yet we also have much to contribute. This knowledge, which is of love, discloses the true worth of our humanity, our real dignity. This is its supreme advantage. For we human beings are not plasticine figures, to be moulded into shape at the hands of a political ideology, or under economic demands. Nor, at the end of the day, can we shape ourselves as we please, according to fashion or our untutored desires. We are not self-made. Our humanity, thankfully, is more deeply rooted and therefore resilient. Indeed our humanity is a gift to be respected not only from its beginnings to its natural end, but also in the other ethical demands it places on us all. Tragically this humanity is often corrupted and distorted, by the misuse of power, by every evil and disaster. But so often we see that the miracle of love is stronger than such corruption. Love has the power to reveal again the depth and truth of our humanity. This is achieved in the enduring love of parent for a wayward child, in the love of friend or spouse faithful through every crisis, and in the unconditional love given by the saint, often to the poorest and most forgotten. This is the love given supremely in Christ, and in him crucified. In Him we find an unambiguous declaration, a manifesto, of our humanity in its full stature. And this manifesto is not a pamphlet but a person. It is, therefore, an invitation to know Him and be known by Him, to love Him and be loved by Him and so with Him find the fullness of life. In Christ we see a maturity of love that flowers in self-sacrifice and forgiveness; a maturity of power that never swerves from the ideal of service; a maturity of goodness that overcomes every temptation, and, of course, we see the ultimate victory of life over death itself. In Christ our true destiny is proclaimed in the resurrection of the dead and his promised eternal fulfilment of life in the new heaven and new earth. The paradox of faith is that when we conform our lives to Christ then we gain our true freedom. And its fruit is profound and lasting happiness. This is the testimony of the true disciples of Jesus, great and humble alike. It is a testimony which shines across the ages and still in our day. As I take up this new office, I ask for God's blessing. May we be deeply rooted in the Lord, and, at the same time, open to every prompting of the Holy Spirit. As St Paul tells us: 'Be united in your convictions and united in your love, with a common purpose and a common mind...think of other people's interests first....in your minds be the same as Christ Jesus.' May this be the experience of every family, in all of our schools, and in our parishes. From this wellspring emerges a profound desire to reach out to all, to engage in the work of building a world that reflects a little more closely the compassion, the justice, the tender mercy of God. This is the inspiration of Christian faith and one that serves our society well. This is the vision to which I readily commit myself today and for which I ask for your prayers and cooperation. "In the End, We Are All Fishermen"